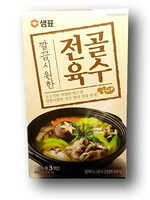 Noodle: Wheat flour, egg white, salt, soybean oil, raising agent (E500), antioxidant (E319), emulsifiers (E1413, E1420). 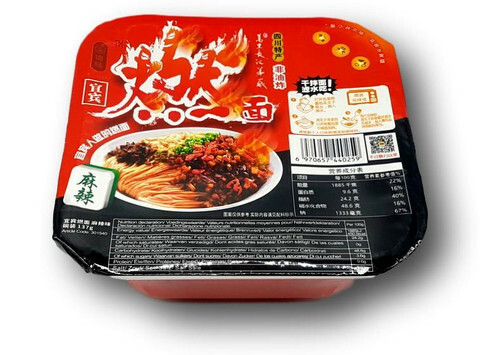 Sauce: soybean oil, fermented mustard, soy protein, chili, preserved chili, dried bean curd (soy), salt, ginger, preserved ginger, broad bean sauce [chili, broad bean, salt, wheat flour, preservative (E202)], Sichuan pepper, flavor enhancers (E621, E635). Oil: soybean oil, chili, flavoring. 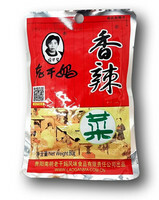 Contains: wheat, soy, peanut and egg.